Landing pages for your skills with videos and websites references of your trainings.Widgets and shortcodes are implemented for displays. 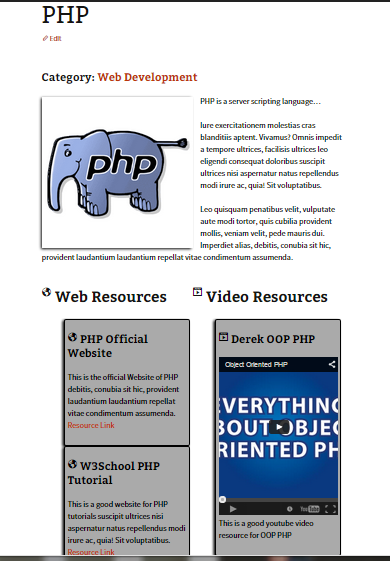 It is now easy to present our set of skills to be added to our Personal WordPress Websites. The plugin creates post type for skills having featured image into it. The best thing about the plugin is that you are able to replace all the skills tag that found at the content sitewide with the link to your skills landing page. You can also add your skills to your widgets area through widget functionality. A carousel of featured images from your skills are added to your widget contents. Added shortcode functionality to display a carousel of skills [sherkbreakerskills title=”These are my Skills”] . Create landing pages for your skills with description, trainings, related videos and related links. Search the contents of the website with your skills tags and replaced links to your skills landing page. Widgets with beautiful carousel using featured images set to your landing pages. SherkSkills post type should now available at dashboard and start creating sherkskills post type. Add Sherk Skill tag at the upper right on the edit Sherk Skill view. Add Featured Image for the Sherk Skill which is to be shown at the frontend and Widgets. Add Website References for your Skills. Add Video References for your Skills. Add the Sherk Skill widgets to your widget area. Added shortcode functionality to display a carousel of skills. ex. Look for Sherk Skills Slider Widget and drag it to the widget region you would like it to be shown. Configure your Sherk Skills Slider Widget, add title and save. Copy the shortcode, paste it to the content text editor and update the title of your shortcode.